The census of 1851 shows that Little Milton had 5 shops, 4 stone masons, 3 livestock dealers, and at least 3 pubs. Farming was the main occupation, but further back in the 17th and 18th Centuries there were wheelwrights, carpenters, cordwainers and blacksmiths. Local quarries also provided employment. Visitors today will find only The Lamb Inn and the Community Shop. 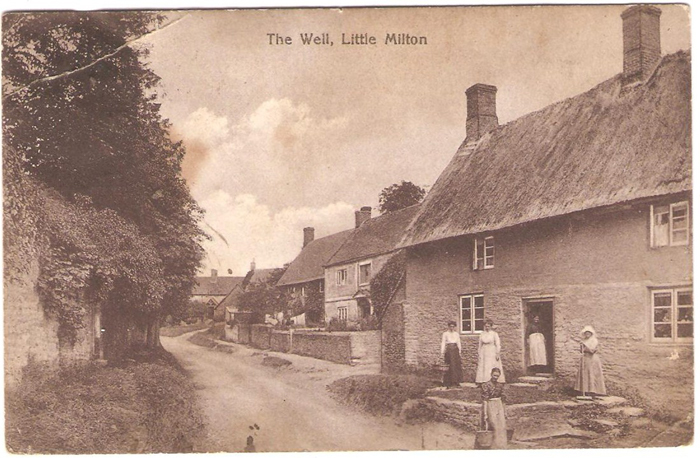 Visitors today will find only one shop, the village post office stores, but in the census of 1851 Little Milton was a very active village with five shops, four stonemasons and three dealers of livestock. Farming was the main occupation of the village with prize flocks of Downs Cotswold sheep recorded in 1934. Also recorded in the 17th and 18th centuries were wheelwrights, carpenters, cordwainers and blacksmiths, with quarries providing employment. Many of the aforesaid occupations were still carried on well into the 20th century. The present church of St James was built in 1843/44 and has a full peal of six bells. Set on high ground the church commands a fine view over fields. A footpath beside the church will lead you down through fields and spinneys to the river Thame at Cuddesdon. A wealth of information is passed on today through the children and grandchildren of those who lived in Little Milton during the mid 1880s. During that time the village school had around 100 pupils. When attending church services the girls had to curtsy to the vicar on entering and leaving the church. Evening classes were run for the men of the village to learn to read and write as many of them had little or no schooling prior to the mid 1880s. Cattle and sheep were a common sight being driven through the village on their way to Thame market, and the carrier’s cart was a useful means of transport for shoppers as an alternative to walking the round journey of 12 miles. From about 1920 means of transport changed. There were few cars, but bicycles had become very popular and the young people of the village could cycle to such places as Oxford, Thame, Wallingford and Abingdon to visit cinemas and friends. Village life was far from dull and listening to villagers who were children and teenagers during that period, they had a happy and full life, every season bringing some kind of celebration in the village to look forward to. On Christmas Eve the bell ringers rang the midnight peal and then collected their Christmas boxes. This was followed on Christmas Day by family parties and on Boxing Day the Mummers would perform around the village followed by an excited band of children. Primrose Day on Good Friday was the only day on which people were allowed to pick primroses from Haseley Cover. These decorated the church and were given to the old people as Easter posies. On the 1st of May the children would get up very early and with their garlands and head-dresses would go from house to house singing. It is recalled that provided the men of the village went to church on May Day they were then given the day off and went home to plant their vegetable gardens. Feast Sunday was the highlight of the year, always held on the first Sunday after the 5th of August. It began with an open air service at the Cross accompanied by the Chalgrove Brass Band, the Feast followed and an afternoon of fun at the annual fair. In conversation with people who live, and have always lived, in Little Milton it would appear that this day was the one most looked forward to. The village has altered little in appearance, although small develop­ments have appeared. At Old Field, off Thame Road, houses were built and reserved for servicemen returning from the Second World War, and bungalows for the elderly and retired. Other more recent homes are mainly occupied by people who have come to the quiet of village life, and commute daily to their work or are retired. Annual events today are still looked forward to, such as the village Fete, held in mid-June in the grounds of the manor house, by kind permission of the owners, a day which can only be described as a continuation of the old Feast Day.